Lots of gamers keep their old consoles after they upgrade to a new model just in case the desire to play some old games hits. 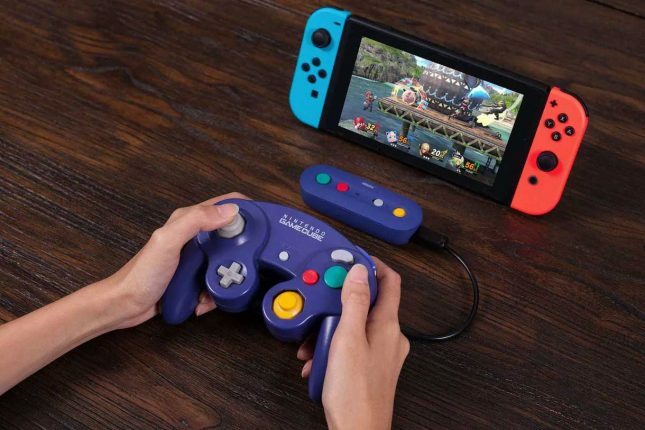 Nintendo fans who have a GameCube and controllers around the house will want to break out those GameCube controllers and plunk down some cash on the 8BitDo GBros. wireless adapter on December 7. That is the same day that Super Smash Bros. Ultimate launches, clearly 8BitDo knows Switch gamers want a better controller for that game. That game will support the Switch Joycons and Pro Controllers right out of the box. Originally the GameCube controllers were wired. The 8BitDo wireless adapter has a short length of wire that connects to a wireless adapter allowing you to sit across the room. Having that short cord, and the largish adapter hanging off your controller might get annoying. The adapter connects to the Switch via Bluetooth. The GBros. adapter supports NES Classic, SNES Classic, and Wii Classic controllers as well. The adapter sells for $19.99 and is up for pre-order now reports Polygon.